Its important that we all keep moving regularly as we go through life. For a lot of us, that’s not too difficult to physically (mentally is another thing). But, when you have something like Parkinson’s it can be tough. And, it can be tough on family caregivers if their loved one stiffens up and isn’t able to participate in regular ADLs. However, there is a program out in Indiana that works on a lot of the issues that seem to dog the parkinson’s patient. Parkinson’s is a neurodegenerative disorder in a specific area and nerve of the brain, causing various symptoms often including tremors, slowness, rigidity, gait and balance issues. It’s “a disease where the doctors don’t know who will get it, how they get it or why,” he said. Based in Indianapolis, the parent organization, Rock Steady Boxing, implemented information from medical studies that indicated intense exercise focused on movement, balance and hand-eye coordination could help. According to Rock Steady’s website, recent research indicates some types of intense exercise may slow the degeneration of the nerves and disease progression. 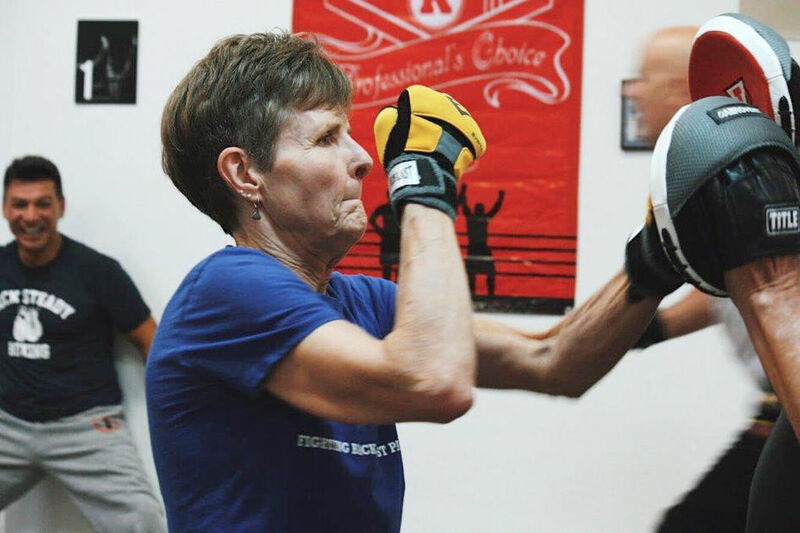 So the exercise of boxing, with footwork and intense arm motion, can help Parkinson’s sufferers to get better. Many Parkinson’s patients end up depressed because of physical problems that cause them embarrassment and the inability to do things they used to do. The activity of boxing helps alleviate the depression and stress, and improves physical function, which in turn helps the boxer move out of depression and into a more confident attitude.